For a wonderful tea set, it’s often not enough to just have a great teapot since there is a lot of paraphernalia required to make it complete. However, finding the best tea accessories might not by be the easiest job in the world for the sheer reason that there is so much to churn through, including tea infusers. These are considered to be an obligatory addition to any set by tea purists, as they will make a huge difference in the taste of the resulting drink. This product is both very popular and well-rated on retail sites as it can be used with virtually any variety of tea, its holes being too thin to allow any fine grains through. Due to the way it’s constructed, it doesn’t float and the small silicone flower that also serves as a handle is used to hang it from the edge of the glass. It has a very friendly design and good quality stainless steel was used for the mesh, so it won’t develop any rust over time. The rest of it, meaning the handle and a small holster, is chemically inert silicone, which is also BPA-free. If you’re after something classy, then this Apace infuser should deliver, with an elegant design which uses 304 stainless steel for superior corrosion resistance. It works with large, medium and ultra-fine leaves, and due to its relatively large size these can move about, releasing more of the aroma. It can be purchased in 3 colors, gold, rose gold and silver to complement whichever tea set you might be having and each package also contains a spoon and drip trays. The manufacturer doesn’t mention if it’s dishwasher-safe but recommends a simple rinse after each use for cleaning. This simple infuser from OXO features a long handle with a non-slip grip at the end which will allow you to comfortably use it with very hot beverages. The round head which uses a sliding mechanism to open and close can act as a scoop, so no additional item is needed for picking up the tea leaves. According to the manufacturer, it works best with whole-leaf teas, either pearl, green or black, but it can also be used with herbs and spices. Since it’s made from stainless steel, it is BPA free and also dishwasher safe. If you’re interested in taking your tea on the go, then this set from LeafLife should allow you to do just that, since its main piece is a 17 oz tumbler which uses vacuum insulation technology to keep beverages hot for up to 12 hours and cool for a whole day. The exterior of this item is made from 100% natural bamboo for a slick look while the 2 internal walls are steel. The fine mesh infuser is designed to be used with it and it’s made from S18/8 food grade stainless steel to prevent staining or odor retention. This ball infuser has personality in spades since it’s shaped like a cute green dinosaur. Made from BPA-free food grade silicone, the handle is flexible so that it can adapt to many types of containers and it ends in a shallow hook (the dinosaur’s “head”) so you can hang it by the lip of deeper vessels. It is recommended for use with medium to large-sized leaves but don’t expect it to hold a lot of these, since it is rather small. Other than that, it is microwave and dishwasher safe and works as advertised. This sloth isn’t doing much hanging from trees but it can fit comfortably on the edge of a cup or mug with its cute face smiling back at you. It is made of heat-resistant silicone which is certified BPA-free and no phthalates were used in its making. It received a number of complaints about not being all that functional due to the holes being too spaced out and the relatively small size but most people appreciated the way it looks enough to give it a good overall score on retail sites. Similarly to the Fred & Friends product we’ve looked at, this item will hang on the edge of a mug or cup with a happy face. It is manufactured from silicone rubber which makes it rather light, which means that it might have a tendency to float if it is not filled properly. 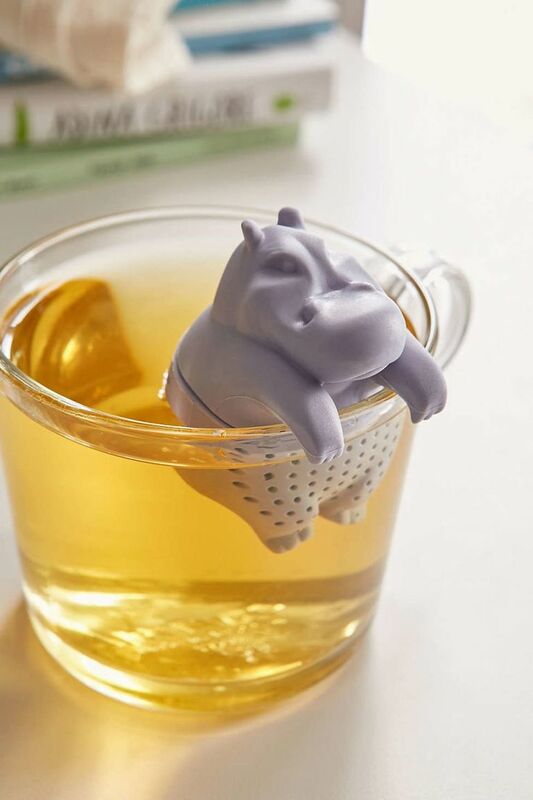 However, it is still very popular with hippo lovers everywhere and the idea of a tea infuser shaped like an animal who hangs around in pools of water has some comedic quality to it. As convenient as it comes, this unit rinses after use and is also dishwasher safe. The top part and protective casing of this tea infuser are made from polypropylene and shaped as well as painted to resemble a Russian babushka doll. The strainer is stainless steel, but according to the manufacturer, the top should be light enough to allow it to float in taller mugs although at 3.5 inches tall it can reach the bottom of most teacups. This option is to be used with coarse tea leaves only and due to its materials, it shouldn’t be used in a microwave. You will get only one per package and these are available in a number of colors for those who desire to collect. 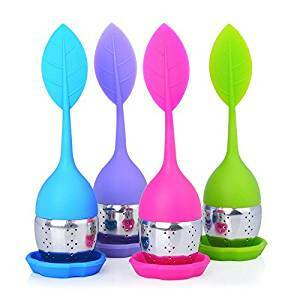 This tea infuser fits into its own ceramic cup that acts to keep dust away when not in use. This can also help you use it around places where a sink isn’t easily available to clean it immediately after use, such as an office. It has a chain to hold it by and having been made of metal, it submerges entirely for the fastest results when using it with medium to large sized tea leaves. At 2 x 2.5 inches it is relatively small so it should fit most tea cups while its chain can be tucked inside when in storage. These items can be purchased in packages of 4 so there will be enough of them for an entire family. The top part which also acts as a handle is made from BPA-free food grade silicone while the strainer is stainless steel. These 2 can come apart to allow it to be filled with tea and the infuser rests on a small silicone saucer when not in use. 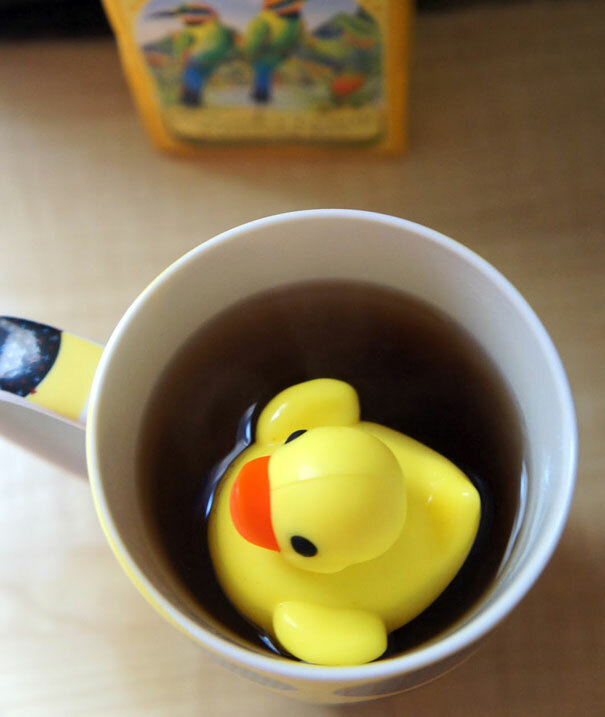 It will float, with the metal part remaining submerged when placed in any liquid, but the leaf-shaped handle acts to stabilize it by the edge of the mug or cup. Our lives could all be improved in various ways. Some people choose personal development books and yoga to help relieve the stress in their life while others go for delicious and relaxing drinks for their personal moments of relaxation. All sorts of aromatic beverages can be made using cool tea infusers. These devices have gained popularity in the first half of the 19th century and since then, they have become a global phenomenon all over the world. With so many options at your disposal, finding the coolest tea infusers to cover your everyday consumption needs is a challenging task. When researching for the best models of such devices for sale, you might become overwhelmed with the endless opportunities at your disposal and this might cause a lot of issues for you especially when you do not have the time to engage in a thorough research. Luckily, we understand your situation and we are ready to help you find the perfect tea cups and professional makers with our all-inclusive guide that features the essential factors that need to be considered for making the right selection. When you are done reading this, we know that you will be convinced about the quality and the reliability of whichever infuser you have decided to get for either yourself, a loved one or a friend because your decision will be a wise one. There are several important aspects that you should know before choosing the perfect device for making the best cold or hot drink at home. Those who are enthusiastic about these healthy drinks should know more about what each type of infuser has to offer and the difference between the various models of devices used for this purpose. Each available product comes with different features that can enable you to engage in various tasks depending on your goal when it comes to making tea. The main purpose of these devices is to provide you with easily made fresh drinks. This goal is easily accomplishable with the best professional devices available for purchase these days. These come in different shapes, sizes, and models to give you the perfect taste that you have always been looking for. Every infuser performs the same job of steeping loose tea leaves and acting as a strainer so that it might not release the leaves into your cup. However, not all of them feature the same size or power. Therefore, it is important for you to think of these aspects and choose the one that features the size that will cover your own needs and requirements. Most devices feature the size of the contents of a tea bag, but in case this is not sufficient for you, there are larger infusers available for you as well. These will help you make a larger quantity of your favorite drink at once, thus helping you save precious time. Those devices that feature smaller sizes are perfect for those who only use them for preparing the drink for themselves in the morning, in the afternoon or the evening. These can also be perceived as great small gifts for your friends who might also be tea enthusiasts as one can never have enough infusers at their disposal at home! The large size infusers are great for those who wish to use larger leaves for preparing their favorite hot or cold drinks or when hosting parties where the attendees will be able to appreciate the wide range of benefits given by these drinks. These devices help you make many cups of high- quality tea so that everyone might be able to enjoy one in no time. The most popular devices of this kind available for you right now feature different shapes. Therefore, if the standard design is not your favorite one, you can easily purchase an infuser that features an innovative shape. There are many ideas you can use as inspiration at this stage. The great news is that all these devices do the exact same job as any other infuser while bringing a smile on your face whenever you see the interesting shape of the device you are using. The most innovative devices used for this purpose can also become great gifts for those who love a good cup of tea in the morning and who also love to overcome the limits of shape and sizes when it comes to using such devices. Nowadays, it is not difficult at all for you to find infusers that feature the shape of animals, submarines, boats, birds, and many other great objects that you might be interested in. Anyone who receives this gift would have no choice but to love it. Even if they do not like to have a cup of hot drinks every day, these devices are also cute to simply have around the home because they can make the atmosphere more welcoming either in your kitchen or the living room. The latest infusers have an essential role in the loose-leaf brewing experience. Even if you or the person you are offering such a device as a present to is a newbie in making such drinks, learning to brew loose leaves with a professional infuser is the best starting point. All you have to do is measure how much tea you want to make, put the corresponding amount of leaves into the infuser, add water and let it sit for the recommended amount of time for the type of drink you are preparing. Even someone who knows nothing about these drinks can figure out the straightforward usage of this product and soon become a tea expert! Is it only suitable for grandmothers? While hot drinks have been around for centuries, these have been considered interesting only by older people for many years. However, recently, aromatic tea has become popular among numerous people of different ages from across the globe because it features numerous health benefits. It includes antioxidants in its composition, it can help increase the stamina during your exercises, and it fights against multiple types of diseases. While the latest infusers can become wonderful gifts, some of them are not entirely safe when it comes to the health of the person using them. Although most materials used for the manufacturing process in the case of such devices are supposed to be low in terms of toxicity levels, some of them have proven to be a common denominator in the development of various health issues. Some people are aware of the dangers involved in using silicone and other materials, so make sure you choose a product made of high-quality materials to avoid putting the person using the device at risk.